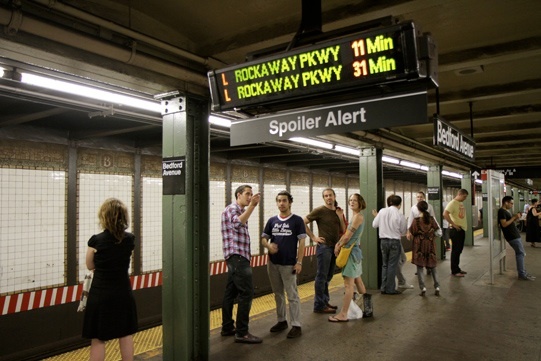 Newmindspace and Jason Eppink recently teamed up to install Spoiler Alert signs under the “wait time” LED signs on New York City subway platforms to help preserve the spirit of adventure for subway riders. Their primary effect, then, is to erode faith in the system, to create expectations that can’t always be met, to raise false hopes, and to erase the mystery and magic of the wondrous system that transports more than five million riders a day. These LED signs also threaten historical social behaviors, rendering obsolete the time-honored New York tradition of leaning over the platform edge with the hope of glimpsing headlights from an approaching train. 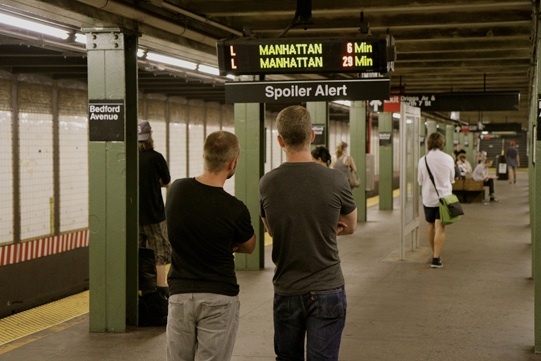 The Spoiler Alert signs warn waiting riders of this potentially unwanted information – allowing them to avert their eyes so they may preserve their spirit of adventure – while still leaving visible the data for travelers who wish to ruin the surprise for themselves.